There are many ways to get involved with Living a Creative Life. Individuals: Do you live a creative life and believe in creating a vital, prosperous and connected city through the arts? Take the Living a Creative Life pledge. Organizations: Do you contribute to a vital, prosperous and connected city through the arts? Become a signatory to the strategy (see below). Sign up for our newsletter: Each week we share stories related to Living a Creative Life in our newsletter. Sign up here! Connect with us on Twitter and Instagram, and share your own creative snapshots on Instagram with the hashtag #yycLCL. Share your stories! 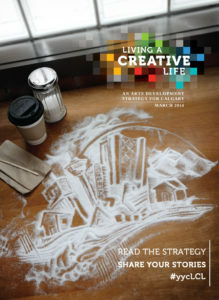 We’d love to hear how you’re living a creative life in Calgary. Email us at news@calgaryartsdevelopment.com. Signatories are groups or organizations that contribute to one or more tactics outlined in Living a Creative Life and agree to consider the strategy’s overall framework during their own strategic planning. Signatories also participate in shared measurement activities so that the progress of the strategy’s goals can be tracked. If you’re interested in becoming a signatory to Living a Creative Life, please contact Kaley Beisiegel, Engagement Consultant, at kaley.beisiegel@calgaryartsdevelopment.com.